Mixed emotions in the Peugeot Team - for them it will be (officially) the last Dakar, but rumours are telling that Peugeot will be back as private Team - eventually in the colours of Citroen. 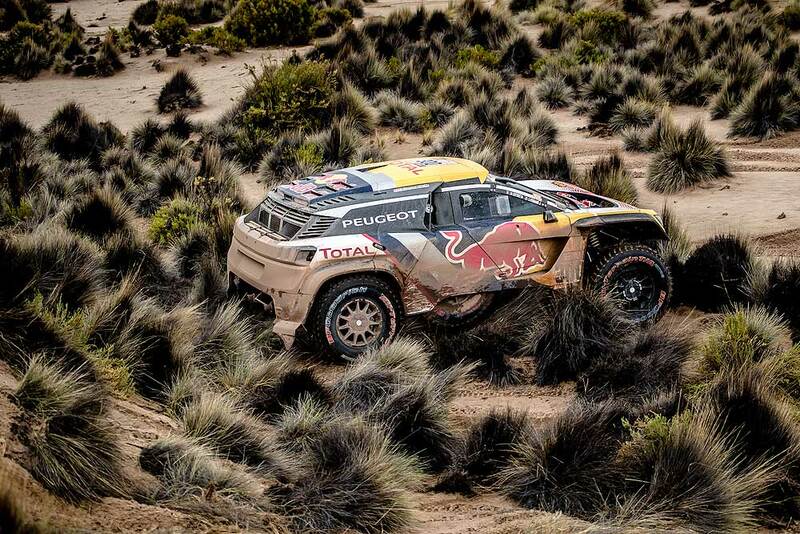 In SS13 composed of two timed sections with very different profiles, the crew of Carlos Sainz and Lucas Cruz once again carefully managed their lead over the competition at the wheel of their Peugeot 3008DKR Maxi. On the other hand, Stéphane Peterhansel and Jean-Paul Cottret lost two places in the general classification after clipping a tree in the first timed section. In control of the race with a lead of than an hour over the competition this morning, Sainz and Cruz avoided the many pitfalls of the penultimate stage. Despite a small off during the opening section, the Spanish duo conceded only a few minutes to their pursuers. They are still firmly in the lead, 46:18 minutes ahead, with only a 119 km stage remaining on Saturday. "The first part of the stage was really tricky," said Sainz. "I don’t know what happened to the competitors who left after me, but I'm sure there were a lot of problems. The second section was more typical of a WRC stage and a little less complicated, even though there were parts that were really narrow for our car. The upsets show that the race isn’t over yet. I hope everything will be fine on Saturday." For Stéphane Peterhansel and Jean-Paul Cottret, stage 13 quickly turned into a nightmare. At kilometer 78 of the first stage of the day, the front left wheel clipped a tree hidden by a bump, breaking a steering rod as well as the power steering. The defending champions began repairs, soon helped by Cyril Despres. They crossed the finish of the first timed section with a deficit of 57 minutes, before the assistance team intervened in the neutralised section to change the whole steering (rack and column). This event unfortunately caused the duo to fall from 2nd place to 4th in the general classification, eight minutes from the podium. It also left Peterhansel with a sprained thumb. "In the first timed section this morning, we arrived in a winding area with vegetation," Peterhansel reported. "We attacked a descent and couldn’t avoid touching a tree, which did some damage to the front left of our car. We started to repair it, and Cyril and David stopped to help us. After losing more than an hour, we were finally able to leave with an impaired car. This sadly ends any chance of achieving the one-two we hoped for. We are very disappointed for the whole team." Cyril Despres and David Castera once again behaved like model team-mates, assisting Peterhansel and Cottret during the first timed special. "This morning, while we were following Carlos, we saw that Stéphane and Jean-Paul had a problem. We stopped to help perform a makeshift repair to the steering system so that he could finish the stage, and then left and carried on."